Prepared for the 10th Olympic Games in Los Angeles. The Tenth Olympic Games Los Angeles California July 30 - Aug 14 '32. 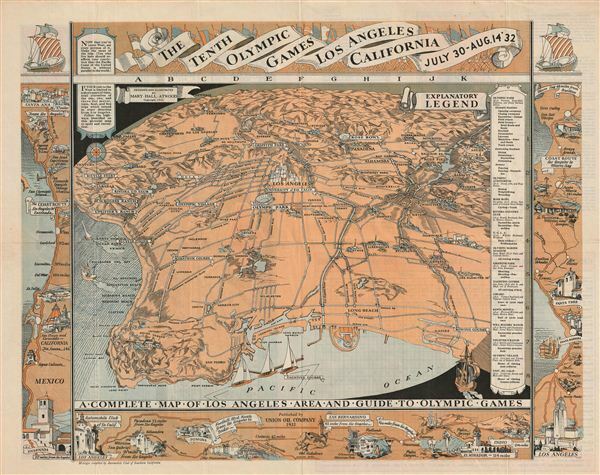 An uncommon printed map of Los Angeles prepared by Mary Hall Atwood for the 1932 Tenth Olympic Games. The map covers the greater Los Angeles area from Ventura to the Pacific and From Point Vincente and Long Point to Azusa. Various points of import to the Olympics are noted, including the Olympic Villages, Olympic Park, the Marathon Course. Further, the map also notes interesting destinations that may be of interest to tourists, including US> L. A, the Riviera Country Club, the W. Rogers Ranch, and La Venta in Palos Verdes. Surrounding the main map is are several smaller pictorial map detailing the various routes including, Los Angeles to ensenada, Los Angeles to Indio and el Mirador, and Los Angeles to Morro Bay. Another small pictorial map on the verso detail the Olympic City. Mary Hall Atwood (1894 - 1950) was an American artist who specialized in murals and map-making. Born in Chicago, Atwood studied at the Academie Julian as a student of Robert-Fleury and Jean Francois Millet. She moved to Los Angeles in the 1930s and soon gained a reputation for the decorative maps of Southern California. Very good. Original folds. Printed on both sides.